These are from Hamakua Plantations. Funny, I went to their website, and they don't list these as among their products. Perhaps even they, are a little shy to admit that they're responsible for unleashing this into the American snackfood marketplace. 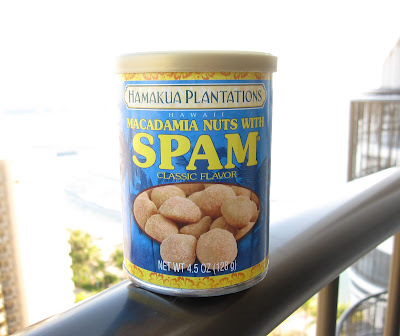 So, do these taste like Spam? Yup, they sure do! They even have a little bit of that pinkish color to resemble the actual compressed salted-swine floor sweepings. I found these at an ABC Store in Honolulu, which are everywhere.